August 30, 2016 (CHICAGO, IL) – Gold Eagle® Co. (“Gold Eagle”) is pleased to congratulate Matt Banach, Director of Sales and Marketing Support and Ashley Strubel, National Sales Manager, for their inclusion in the SEMA News “35 Under 35” list. Both are top rising leaders who are bringing exciting new ideas and renewed enthusiasm to every segment of the automotive specialty-equipment industry. To be considered for inclusion in the SEMA News 35 under 35, honorees must first be nominated by one or more industry peers. 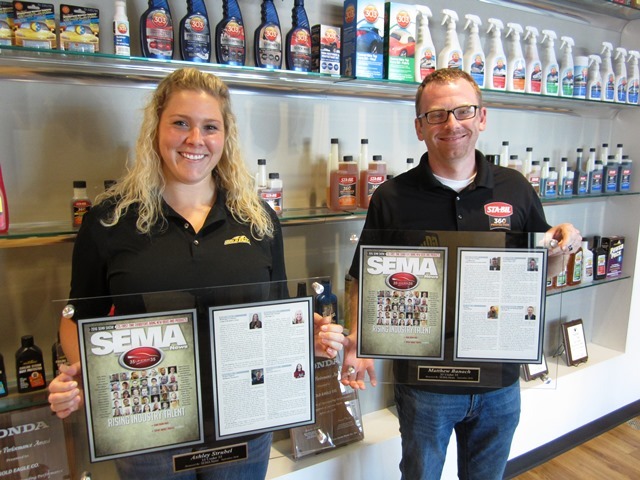 SEMA News makes the final decision by selecting the top candidates who are making a significant industry impact through their leadership within their company. Banach grew up restoring cars with his father and has a true passion for the industry. In the five years that Banach has worked at Gold Eagle Co., he has been pivotal in the company’s efforts to educate consumers about its protectants and fuel additives. He has introduced new partnerships that have helped the company reach a new demographic, often serves as the company’s technical expert at events and contributes to new product development. Strubel has had a lifelong interest in the automotive industry and spent many days with her dad riding around in his ‘701/2 Camaro and helping at car shows. She excels in marketing to the rapidly changing environment of today’s automotive consumers and always looks for opportunities to bring new and forward thinking ideas to the company’s marketing efforts. She stays on top of current trends and enjoys the challenge of reaching the millennial buyer and making an impact where they shop, work and play. To learn more about Gold Eagle please visit www.goldeagle.com.